You're somewhat experienced with the skills necessary to complete this project, but you haven't mastered all the elements, yet. Planning a party? 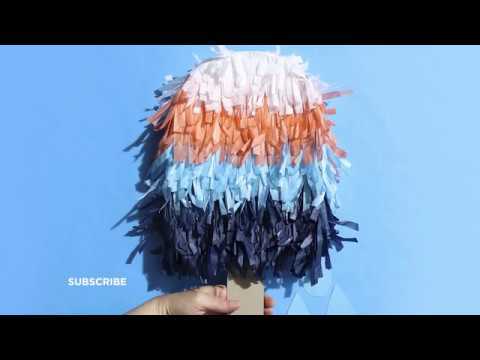 Surprise your guests with this clever, colorful popsicle piñata! We’ll show you how to make it with a tassel garland from Martha Stewart’s indigo party collection, so there’s no fringing necessary! Just take a look at our instructions below and get started! - While you’re working on this project, use our photo of the piñata as a guide. - This piñata is for (awesome) decoration only! It’s not intended to hold candy or prizes. Our template will make this project even easier! Just click here to download and print it. Cut out and then piece together the large popsicle shape with tape. Don't forget to cut out the large popsicle and popsicle stick shapes. Trace the large popsicle shape onto each of your two pieces of kraft cardstock, then cut them out. Trace the popsicle stick shape onto a piece of chipboard and cut that out, too. Measure and cut three 2" x 12" strips of kraft cardstock. Cut a 2" horizontal slit in the center of one strip. Lay one of the large cardstock popsicle shapes onto your working surface. Find and mark the center point across the bottom of the popsicle as well as the center point along one 12" edge of the strip with the cut slit. Now, while holding the strip upright (so that it’s perpendicular to the bottom edge) along the bottom edge of the popsicle, line up the two center points. Run a thick line of hot glue along the seam where both pieces meet, to hold them together. TIP: Hot glue dries fast, so work quickly! Repeat to hot glue the remaining strips all the way around the popsicle shape. Each time you add a new strip, make sure to slightly overlap the edges as you hot glue them in place. Next, add a thick line of hot glue across the chipboard stick shape, about 1½" down from the top (flat) end on both sides. Push the shape through the slit of the strip glued at the bottom of the popsicle. Hold for a few seconds until glue sets. Add more glue, if needed. Run a tick line of hot glue along the curve of the top of the second cardstock popsicle shape. Line it up with the curve of the perpendicular strips attached to the first shape and place it on top. Work in small sections and continue to add glue to the edge until the second piece is fasten to the first, all the way around the shape. Paint the bottom 3" of your popsicle, including the front, sides and bottom, then set it aside to dry. Remove the tassels from their length of twine and set the twine aside. Cut the clear string securing the bend of each tassel and then cut the tassel in the center of the bend. Trim down each tassel half to about 2½" in length, then unravel it. Carefully separate and straighten the three tissue paper layers. Repeat this step for each tassel. Next, paint a line of Mod Podge® from one side of your popsicle, across the front and around to the other side. Take one of your indigo blue tissue paper pieces and place its (top) flat part onto the wet Mod Podge®, centered across the front, with the fringe ends pointing down. Spread out as flush as you can against the wet Mod Podge®. Place another piece, in the same manner, on each side of the centered piece, and wrap around to the sides. TIP: The pieces on each side of the center will hang off the back. Do not trim as you will wrap them around to the back once you are finished attaching all of the fringed tissue pieces. Paint a second line of Mod Podge®, just above the top edge of the first row of fringe, and repeat Step 13 to add a second row of fringe. Continue to repeat Step 13 all the way up the popsicle. First, use all the indigo tissue paper for the lower section. When that’s gone, switch to light blue fringe, then coral, finishing with white fringe at the very top of the popsicle. TIP: Because the popsicle gets a little narrower at the top, once you reach this part, you’ll have to cut the tissue strips a bit shorter and piece the lines together. Trim down the fringe at the very top strip, so that it’s a bit shorter. Turn your popsicle over and brush Mod Podge® around the side and top edges. Wrap the excess tissue from the sides and place onto the wet Mod Podge®. Let dry. TIP: If you want to hang your piñata as a fun party decoration, take the length of twine that came with your tassel garland and cut a piece that’s about 2" long. Form this piece into a loop, then hot glue the loop to the popsicle’s back. Use Command™ strips for a super-easy way to hold it in place temporarily. Kraft Cardstock Paper by Recollections®, 12" x 12"
Kraft Chipboard Paper by Recollections®, 12" x 12"